I recently started reading “Birds Without Wings” by Louis de Bernières after a stint of fantasy novels which I’m embarrassed to even mention, but do so anyway just for the contrast, so that you understand how good it feels to come back to such exquisite writing. After this fantasy stint I was feeling desperate to read poetic prose to pull me back into my little sentimental world that books like “Written on the Body” and “Unbearable Lightness of Being” have created. 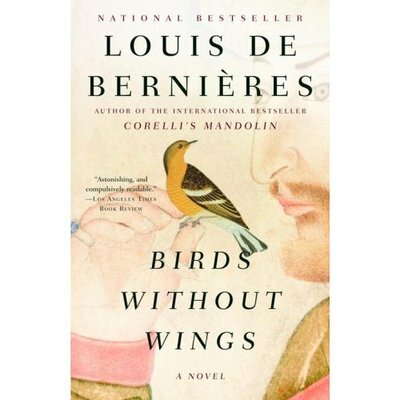 I found “Birds Without Wings” because I loved “Corelli’s Mandolin,” which was written by the same author and was the perfect combination of history and fiction, poetry and prose. I picked up this book and immediately fell in love, so I include some of my favorite passages so far, and recommend this book to you if you agree with my taste in the writings that I’ve posted in this blog. Thank you for your poetry collection. It’s wonderful.